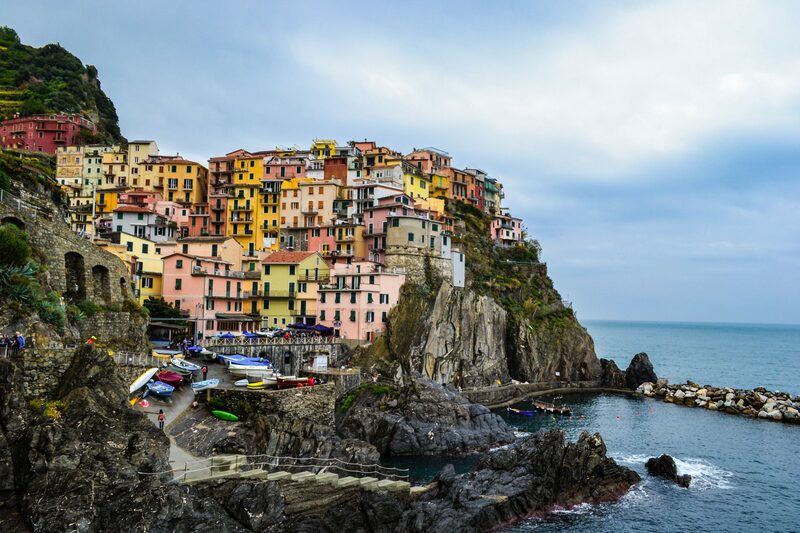 When we think of the Italian Riviera, the picturesque town of Manarola comes to mind. This town (pictured below) is one of five coastal towns that makes up what is known as Cinque Terre (or “five lands” in Italian). When we were first planning our European adventure, these gorgeous, rugged seashore towns were on the top of our destination list for Italy. Here’s our guide to traveling Cinque Terre on a budget! Fun Fact: Cinque Terre is a national park and a UNESCO World Heritage site! Cinque Terre is nestled on the rugged coast of the Italian Rivera, which doesn’t make it very easy to reach. Basically, you have two options: the more wallet-friendly option is to take a train, but if you have some cash to spend, you can take a ferry and get some gorgeous views of the coastline from the sea. *Note: We’ve heard that you can get here by car, however parking is very expensive. If you go by car it is cheapest to pay for parking at La Spezia and go the rest of the way by train. View from back alley in Cinque Terre. We took our day trip from Florence and bought round trip train tickets to La Spezia (where you will purchase your entrance fee and train tickets into Cinque Terre) for EUR 23,30 each. You can also reach Cinque Terre from Levanto, which we’ve heard is another gorgeous Mediterranean town worth exploring if you have the time. From Florence to Cinque Terre, the trip was about 2.5 hours each way, with a transfer in Pisa, however you can reach La Spezia on a direct train from Florence’s central station (Firenze Santa Maria Novella) if you are willing to pay more or if you are lucky and find a cheap ticket. Tickets can be purchased at the station. MAKE SURE YOU CHECK WHEN THE LAST TRAIN LEAVES FROM LA SPEZIA TO FLORENCE! It’s never any fun being abandoned at the end of a long day without your belongings and having to book a hostel or hotel last minute. Trust us. Once you arrive at La Spezia, find the ticket booth inside the train station. Basically, just follow the crowd. We found that most people spoke English in case you have to ask anyone for directions. Here (or at Levanto), you have the choice of purchasing a EUR 8,00 Cinque Terre card that grants you access into the towns, or a EUR 16,00 Cinque Terre card that grants you access into the towns and the trains that go between them. GO WITH THE EUR 16,00 CARD!!! Sara and Gabby enjoying the view on the way from Vernazza to Monterosso al Mare. towns, unless you want to hike all the way back to the first town at the end of the day to board the train back to La Spezia (more praise to ya if you do! ), we would spend the extra 8 euros for the train. Furthermore, it doesn’t hurt to have it in case you hike some of the trails and get too tired to hike the rest. Especially if you want to have time to explore all of the back alleyways and take pictures like we did. Gabby wandering around the back alleys of Vernazza, Cinque Terre. Also, many of the trails close off part of the year due to rain, so check before you go if you do plan on hiking all of them. When we went, two of them were closed. We did hike between Vernazza and Monterosso al Mare (the fourth and fifth towns), which was a rough one after walking the previous towns the entire day and took us about an hour and a half. You can find more information on the Cinque Terre card and trail closings here. *Note: Stamp your ticket before getting on the train at each town to avoid a EUR 50,00 fee!! Pat taking a rest on many of the stairways in Cinque Terre. Heres where your budget can reeeeally skyrocket. Cinque Terre is not a cheap place to eat. Typically, a meal with drinks will set you back about 25-40 EUR per person. So eating out for lunch and dinner would cost you 50-80 EUR! *Note: If you do decide to eat dinner here, take note that restaurants typically close between lunch and dinner, so don’t expect to have many options open from 3pm-6:30pm. As romantic as all those coastal restaurants looked, we weren’t in the position to spend our entire days budget on one meal. Instead of eating out at Cinque Terre, we bought pre-made sandwiches (they cost about 3 EUR each) and snacks at the train station in Florence before we left for the day. This way, Patrick and I each had three sandwiches (and some snacks) for about 10 EUR each. Plus, we had a romantic picnic while hiking between Vernazza and Monterosso al Mare on top of a mountain with the most amazing view! Pat enjoying the view of the Italian coastline from our hike at Cinque Terre. Yes! It is possible to spend only 10 EUR for food instead of 50+ EUR! It just takes a little bit of planning ahead (and arriving at the train station early in case of long lines). There’s a certain romantic pull Cinque Terre has, making it the perfect destination for couples. From luxury honeymooners to shoe-string backpackers, Cinque Terre offers something for every kind of travelling couple. Here are some things to do in Cinque Terre that we didn’t get the chance to do on our day trip, but will definitely be trying on our next visit to Italy. Diving: What better way to spend the day with your significant other than exploring the reefs of the Italian Riviera? There are three diving centers located in Cinque Terre, located in Riomaggiore, Monterosso, and Levanto. You can get information on their locations and phone numbers by clicking here. Don’t have your diving license? Don’t worry! There are plenty of places to rent snorkel gear along the waterfront. Sunset Boat Tour in Manarola: A Cinque Terre must-do for honeymooners, Angelo’s Boat Tours offers private lunch and sunset tours. Enjoy the view of the colorful Italian Riviera from the ocean with the sunset as your backdrop! Pricing for this trip varies based on group size, tour type, and time of year. Swim: The best beaches for swimming in Cinque Terre are Manarola (on the way to Corniglia), Vernazza, and Monterosso. SUP/Kayak: With kayak and stand up paddle board rentals all throughout the five coastal towns, let your feet take a rest and travel between each village on the water! Each town is only about 30 minutes away from one another via sea kayak. This is a great option in the summer, as you can leave the crowds behind on the trains and trails, as well as cool down with a dip into the Atlantic ocean. Wander the Back Alleyways: Cinque Terre has many back alleyways begging to be explored. Get off the beaten path and away from the more touristy areas and explore some of the tiny streets and trails on the outskirts of the towns. You won’t be disappointed! Wandering around the back alleyways of Cinque Terre. So, what was the grand total for our day trip? So the trip set us back about a hundred bucks for the two of us. Not too shabby if I do say so myself, considering we probably would have spent the same amount of money on activities in Florence (entrance to see the Statue of David costs about 16,50 EUR, and the Galleria degli Uffizi costs a whopping 26,50 EUR *Gasp!!*). All in all, Cinque Terre isn’t just a place you visit, it’s a place you revisit. We plan on staying for longer next time, as the romantic, rustic charm of these fishing villages deserves more exploration than we were able to give it. If we were to do it over again, we definitely would have splurged on a hotel to spend the night here and done a diving trip early the next morning, as there are some nice reefs up the Ligurian coastline. Pat stopping to tie his shoe and being a natural model. If you’d like to purchase a guidebook to Cinque Terre, we recommend Rick Steve’s pocket guidebook. Have you ever been to Italy? Where was the most romantic place you’ve been to?